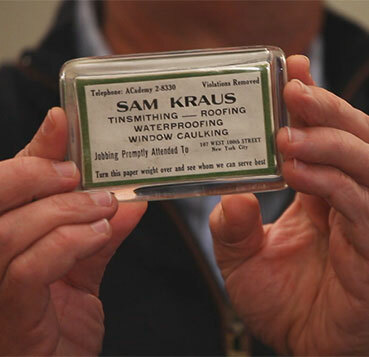 Quality, innovation and customer service have been the guiding principles of Skyline Windows since Sam Kraus founded it as a roofing and waterproofing business in 1921. (Known then as S. Kraus Inc.) Over the decades as Skyline evolved, leadership passed from one generation of the Kraus family to the next and the dedication to craftsmanship and service continuously grew. In the 1950’s, under the direction of Sam's son, David, Skyline entered the window replacement business, then a new and burgeoning industry. Eventually, Skyline began manufacturing its own window systems to meet specific market needs and to provide the quality demanded by customers. When third generation and current CEO Steven Kraus came to Skyline in the 1970s, he moved the company into new and broader product offerings. The integration of state-of-the-art European hardware systems and development of historic replacement window designs are hallmarks of the innovations seen under his stewardship. The turning point for New York real estate and Skyline was the establishment of the New York City Landmarks Preservation Commission in the early 1980’s. As the city’s classic buildings aged, the need for window replacement accelerated. Rather than replace windows with modern fabricated and generic models, the Landmarks Commission drew up stringent standards for window replacement in order to have the buildings retain their original splendor coupled with the newest technology. Skyline worked closely with the Commission in establishing the standards by which all New York landmark buildings’ windows would be restored. This accelerated growth resulted in a brand new window manufacturing plant in New Jersey and spread the Skyline brand throughout New York in buildings such as The Hearst Building, The Puck Building, The Pierre Hotel, The Palace Hotel and many more. Skyline also replaced the windows in many of the most exclusive residential buildings adorning Central Park. Today Skyline Windows is a premier window manufacturer in the U.S. with over 350 employees, a Sales, Engineering, and Service headquarters, and two production facilities offering over 100,000 square feet of manufacturing space. We offer a unique, vertically integrated approach to the design, engineering, manufacturing and installation of customized solutions for all types of projects. Skyline proudly builds on our century-long legacy of fine craftsmanship and service. We have immense pride in our work and are proud to be part of the ever-growing New York skyline.